Pharmaceutical coating machine, as highly efficient, energy saving, safe, clean and mechatronic equipment, is mainly used in pharmaceutical and food industries. Specifically, it can be used for coating tablets, pills and candies with organic film, water soluble film, slow and controlled release film and sugar film, etc. As a result, these products conform to the GMP requirements. 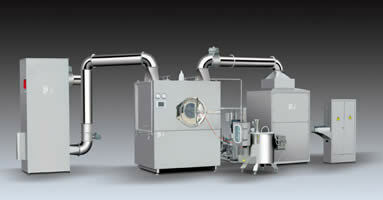 The working principle of pharmaceutical coating machine is as follows. Within the closed rotating drum, tablet cores make continuous complicated orbital motion under the action of a streamline guide plate. During the motion, according to the technological process requirements and rational technological parameters, coating medium automatically sprays. At the same time, hot air, penetrating through the tablet core layers, is supplied by a negative pressure and discharged from the bottom of the layers. Therefore, coating medium sprayed on the surface of tablet cores dries rapidly and evenly, thus forming a solid and smooth surface film. 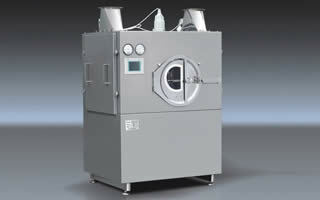 There are a lot of features of pharmaceutical coating machine. 1. The control system is composed of PLC and HMI and the design is reasonable and programming is flexible. In order to meet different needs of pharmaceutical technology, this product has the feature of reliable work and stable performance. 2. Tablet cores are tumbling smoothly and exchanging frequently by the agitator of streamline guide plate, thus eliminating the phenomenon of falling from a high place and colliding. As a result, problem of broken pieces and chipped edge can be resolved and finished product rate can be improved. Besides that, adhesion of coating material can be eliminated by narrow surface of the guide plate, saving coating material and improving medicine quality. 3. Peristaltic pump has constant pressure and variable so a return pipe is not necessary. Turning radius of the drum changes in accordance with the pressure. Slurry output and quantity are balanced automatically, thus stabilizing atomization effect, simplifying the spray system, preventing the spray gun from plugging-up and saving coating material and time. With even atomization and large coverage of spraying, the spray gun is specially designed for pharmaceutical coating machine. And universal adjustable spray head is used so cleaning mechanism of spray gun is not affected by charge quantity. As a result, film coating can proceed continuously. Besides that, there is no dead corner so cleaning is very simple. 4. There are many other functions of pharmaceutical coating machine, such as control and display of negative pressure in coating pan, supplied air speed and temperature and function of memory and printing. All of these abovementioned functions realize the display and control of technical parameters. So in order to conform to the requirement of GMP, they can be used to write SOP operation and guide the operation by quantitative index to guarantee the same quality of each batch. As a specialized pharmaceutical coating machine manufacturer and supplier in China, our company also offers automatic tube filling and sealing machine, pharmaceutical blister packaging machine, empty medicine capsule filling machine, capsule polishing machine and so on.